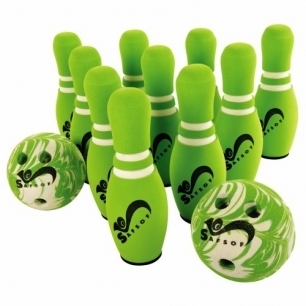 High-quality construction sets this bowling set apart from others in the marketplace. Sturdy pins stand upright. Balls retain their form. Hours of quiet active play ahead! Comes with ten pins, 12"H x 4" and two bowling balls, 6"W. Ages 5 and up. Sold by Gryphon House, Inc. Ships from Kaplan Early Learning Company.